This time of year I love playing, “What’s growing in the pumpkin patch?” I love watching the plants develop. This year, it is especially challenging because I planted as the weather and my easily-distracted personality allowed me to! Last year, I had a nice diagram of the patch and varieties planted. This year, not even a doodle. Then, some of the planted hills didn’t germinate, so I went back through (a couple of times for some of them) and poked a few more seeds into the hill all willy-nilly like. Now, I have a growing, vining, I-Spy game! unlike the typical vines of pumpkin and squash plants. Too much rain? Too cool? In July? In Illinois? Maybe. I pulled off the sickly-looking fruits. Hopefully, there will be plenty of good ones. 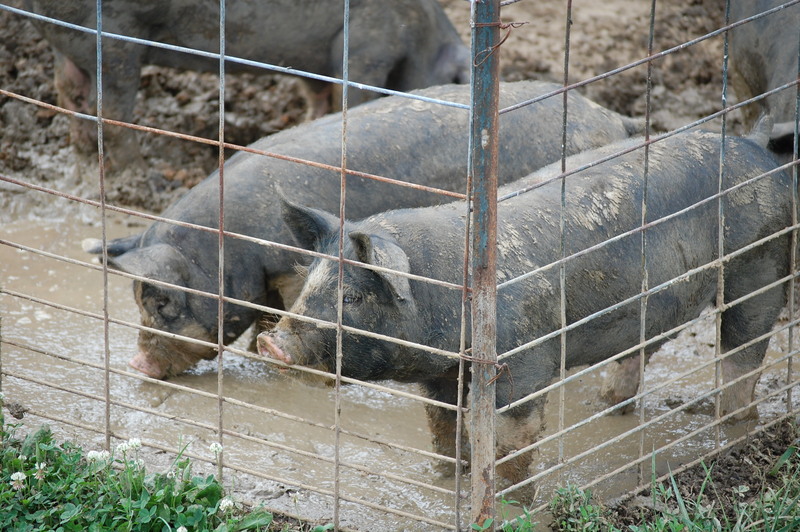 The hogs do not mind the rain and mud one bit. In fact, they have been delighted to play in it. It is impossible to do any of the pig chores without getting a good application of mud on myself. And to think, some people pay good money for that type of spa treatment! I do lead the glamorous life…. This entry was posted in Berkshire Pigs, Country Living, Pumpkin Patch and tagged Berkshire pigs, Country life, farm photos, Pumpkin Patch. Bookmark the permalink. Those baby pumpkins are so cute! If you ever need some extra cash, you could open your own spa! I recommend NOT recording what you planted. Makes it so much fun! We planted watermelon for the first time ‘ever.’ I knew they would vine, but had no idea just how much. It appears pumpkins do the same thing. They are in a raised bed and I haven’t found any that appear to be having problems due to the lack of heat and the over-abundance of rain. My tomatoes, on-the-other-hand, aren’t producing like they did last year. Can’t wait to find out what varieties are where in your pumpkin patch. Yes, watermelons create a jungle, too! The rotten ones were at the “dry” end of the garden, too. Who knows? Mud and piggies just go together!! !